Each day, our Sun pours its energy down onto the Earth’s surface, turning vast expanses of open water into vapor. New research shows the surprising degree to which this clean and renewable process could be used to produce electricity—enough, perhaps, to meet 70 percent of US energy needs. But before this energy solution makes it to prime time, we’ll need to know a lot more about its potential environmental effects. 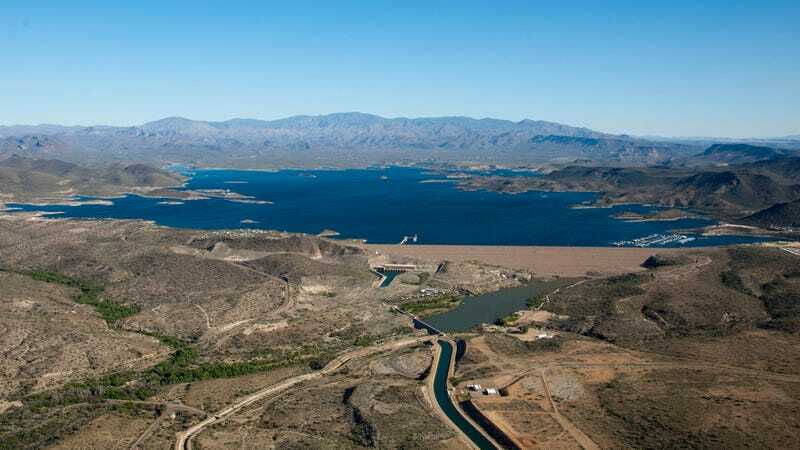 Open bodies of water across the continental United States—excluding the Great Lakes—have the potential to produce 325 gigawatts of power each year through natural evaporation, according to new research published today in Nature Communications. That’s about 87 percent of the electric power produced by all the world’s nuclear power plants combined. At the same time, the new research also suggests that water evaporation farms, though still hypothetical, could provide power densities three times greater than wind power, and significantly reduce the amount of water lost to evaporation. The lead author of the new paper, Ozgur Sahin from Columbia University, says natural evaporation could serve as a reliable renewable energy source, and that the time has come to develop the materials and technologies required to make it happen. The study marks a “first stab” at this potential new power source, but many questions remain—including any negative effects this technology might have. Nearly half of the Sun’s energy that reaches the Earth’s surface drives evaporation, influencing ecosystems, water resources, and climate. Recent studies have considered the various ways in which we might be able to harness the power of evaporation, a prime example being a floating, piston-driven engine that can generate enough electricity to cause a light to flash and power the engine of a miniature car. In the future, a scaled-up version could produce electricity from giant floating power generators installed over bays or reservoirs, or huge rotating machines similar to wind turbines that sit above water. The basic idea is that materials are made to perform work through a cycle of absorbing and expelling water through evaporation. But while slow progress is being made to develop the materials and devices required to pull this off, even less is known about the availability, reliability, and potential for this currently unexploited resource. Sahin and his colleagues are the first to estimate the total potential power available from natural evaporation in US lakes and water reservoirs, while also providing a model to predict how these energy harvesters could actually work in the natural environment and how they could impact water resources and energy reliability. Their model shows that 325 gigawatts of power is potentially available from evaporation via existing lakes and reservoirs larger than 0.1 square kilometer (not including the Great Lakes). That’s around 70 percent of the US electric energy generation rate in 2015. The states with the highest evaporation-energy potential include Utah (47,200 Megawatt (MW) potential), California (27,550 MW), Minnesota (19,251 MW), and Louisiana (14,353 MW). In total, the US boasts 95,000 square kilometers (36,680 square miles) of potentially available water bodies for the task. Take the E.V. Spence Reservoir in Texas, for example. According to the model, if this reservoir were turned into an evaporation power plant, its 38 square kilometer (14.7 square mile) surface area could theoretically generate an average annual power output of 178 MW. By comparison, that’s 62 MW, or 53 percent, greater than the nearby Sweetwater Phase IV Wind Farm. Interestingly, many of the areas with the highest potential are located where water tends to be scarce. Indeed, these evaporation farms could in theory prevent almost half of the water from drifting back up into the atmosphere, which would be a boon to areas like California where water stress is a problem. But with all this water being returned to its source, it’s reasonable to ask what such evaporation farms might do to the weather, and what other knock-on environmental effects might unfold. Locally, feedback effects will also be small if the dimensions covered by an engine are below 500 km. This is due to the important role of horizontal heat and moisture transport in the atmosphere that couples neighboring regions. Therefore, we are neglecting potential feedback effects, as they would not drastically affect our estimates. The overall effect could be minor, or it could be significant depending on the geographical location. It could stunt rainfall (highly unlikely), or as the researchers themselves admit, affect the weather in such a way that nearby wind turbines would lose some of their effectiveness. Evaporation farms could also affect recreational activities, such as swimming and fishing, while turning otherwise picturesque places into complete eyesores. The study didn’t consider issues such as economic feasibility, grid connectivity of water bodies, and impacts on water quality and the environment (including disruptions to local wildlife and ecosystems). Indeed, if even two percent of the total potential is exploited, that’s still an impressive 6.5 gigawatts of energy, which is enough to power roughly two million American households for an entire year. Clearly, there’s a ton of “free” energy out there that could potentially be exploited. But at best, it’s likely this form of clean energy will be used to supplement existing renewable sources, namely wind and solar. And until we know more about the environmental and socioeconomic effects—not to mention having the technologies to pull this off—it’s still something to consider in theory rather than in practice. Correction: An earlier version of this post claimed disagreement between a statement made to Gizmodo by Sahin about potential atmospheric effects and what was claimed in the study. No such disagreement exists, and we’ve rewritten the section accordingly. We regret any confusion.